Now, it's a real shame that this show hasn't garnered the attention it deserves. In a world full of anime that takes itself way too seriously, Gugure! Kokkuri-san is a fourth-wall shattering beacon of light that is sure to have you smiling the entire way through each slice-of-life themed episode. With heart-waming plots, adorable characters (Well, most of them), and beautiful animation, it's hard not to fall in love with this show. Gugure! Kokkuri-san is comedy gold and you'll find yourself both very confused and very entertained watching it. With lines like "The cyclops returned from outer space", you know it has to be good. If you're looking for a light-hearted anime to cure the blues or just otherwise pass the time, I highly recommend you give this gem a try. Behold the Power of Salt! I'm not a big fan of ghosts or spirits or anything connected to them. Six episodes in, I never want it to end. Gugure! Kokkuri-san features a fox spirit that has been replaced by Google in his question-answering usefulness. In fact, the "spirits" are very un-spirit-like and might as well be shapeshifting weirdos with fox/dog ears. Overall, watch the first episode. If you hate it, this is probably not the anime for you. If you like it, enjoy a nice, consistently heart-warming and absolutely hilarious anime. All in all, it's a pretty fun show. This is mostly a just-for-fun sort of show; not quite a slice of life sort since at least one character has a driving goal, but it's sort of kept more as a check-in point to show things are progressing in some fashion rather than being the direct plot. It does have its touching moments, but they aren't the main point. All that said, it's not a for-everyone thing. There is a definite level of perversity at points; these are Japanese spirits, after all. Some people might find that a bit discomfiting since a very young girl is involved, so be warned on that angle. Comedy wise: lots of slapstick, fourth wall breaking, and jokes based on pop culture of the last couple decades. They manage to work the jokes in without you actually having to know the source, though. It's more like a bonus when you can pinpoint the actual inspiration rather than a requirement to get amusement out of it. When I first started watching this show, the little girl was a bit annoying. The monotone voice was really getting to me. Her voice actually adds to the hilarity of this anime. I absolutely love this show. It doesn't have much of a plot line but makes up for it through the humor. It's bizarre, wacky, humorous, and adorable at the same time. A must watch if your not looking for anything too serious. A female character who is able to match wits with a fox god. A laugh a minute with intelligent humor. I hope that she never gives in to his foxy wiles. I am really looking forward to the rest of this series and meeting the other kami. Truth: I laughed so hard that I scared my cats (they are still mad at me as you read these words). "Gugure! Kokkuri-san" is many things, but "predictable" it certainly isn't. You rarely if ever know what comes next, which is really half the fun. This can, in part, be attributed to the fact that the plot is rather random and episodic, but the show also has the respectable tendency of defying your expectations, prompting you to, instead of overanalyzing things, just sit back and enjoy the ride. The show is without doubt professionally made. It does not desire to be anything less or more than what it takes to entertain the viewers. The characters are not especially complicated, some are based on well-known archetypes (although some aren't), but still have just enough depth to make you second-guess your initial impressions. The plot does not really progress per se (only the cast grows), but things never become stale. And just when you get a little too used to the slapstick comedy, the series surprises you with a serious twist - only to troll you by jumping back to comedy when you start to expect some sort of earth-shattering plot development to occur. The one weakness this anime has stems from the very same source: you can't help but wonder if the series could have been so much more than this. The characters all have sides of them that we can barely glimpse, and leave us wanting to know more. The plot itself has so many possibilities beyond the usual status quo that are only very rarely explored, and so many chances for character development which are, more often than not, ignored. Still, I guess this is also a sign of a well-made show: it leaves you wanting more. 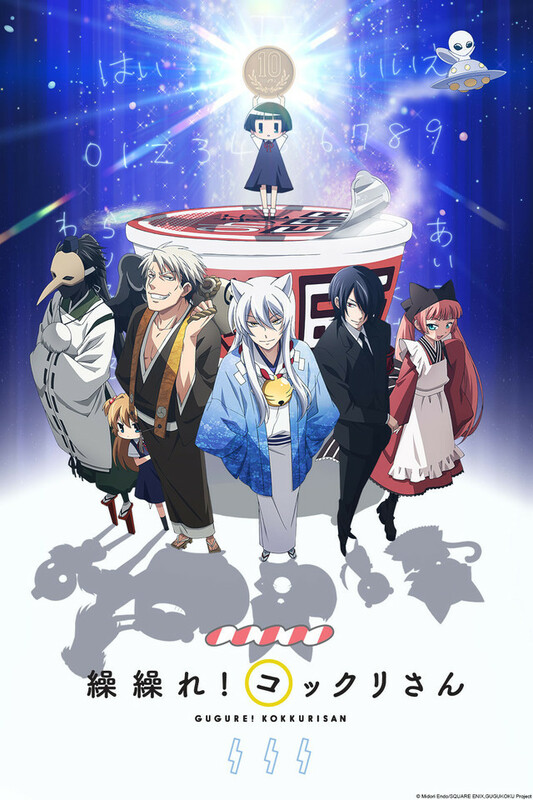 Perhaps this is not the anime that will change your life, but "Gugure! Kokkuri-san" is well worth a look. I personally like the kind of humor in this show. After watching the first episode I feel this show is just going to be a nice heart warming comedy. I have really high hopes for this show. If you enjoy the comedy in this show it is a must watch this fall . Surprised this doesn't have more reviews, I hope people aren't missing this! I stumbled on this looking for something new and I'm so happy that I started watching Gugure! Kokkuri-san! It's hard to throw it into a genre; as stated by a previous reviewer, it's "not an action or slice of life" anime, simply just a great story with amazing writing. The characters are odd but strangely lovable in all their weirdness and they each have redeemable qualities that come out the more you "get to know them." Kohina is adorable in both her "doll form" and "human form" depending on what type of "feels" they are trying to get across but I'm happy either way. I've watched other series where they have characters that are like Kokkuri-san, the fox spirit god, etc, yadda yadda but this is the first series where I have actually enjoyed the character. I think it's because he is a little more on the feminine side and has more of those qualities such as cleaning and cooking, which almost seems silly but I like that he dotes on Kohina in a maternal way as opposed to a cocky I'm-Better-Than-You way or sexual way. I'm consistently laughing out loud every episode and I l look forward to the weekly antics. This show is full of the kind of 4th wall breaking, slap stick comedy that can make you laugh so hard you need to pause the stream so you don't end up missing the next punch line. If you're looking for a good laugh then I highly recommend checking out Gugure! Kokkuri-san.